Little, Brown Books for Young Readers, 9780316220835, 384pp. In this gripping, eerily prescient sci-fi thriller that Kirkus described as "masterful," Tool--a half-man/half-beast designed for combat--proves himself capable of so much more than his creators had ever dreamed. He has gone rogue from his pack of bioengineered "augments" and emerged a victorious leader of a pack of human soldier boys. But he is hunted relentlessly by someone determined to destroy him, who knows an alarming secret: Tool has found the way to resist his genetically ingrained impulses of submission and loyalty toward his masters... The time is coming when Tool will embark on an all-out war against those who have enslaved him. From one of science fiction's undisputed masters comes a riveting and all-too-timely page-turner that explores the intricate relationships connecting hunter and prey, master and enslaved, human and monster. 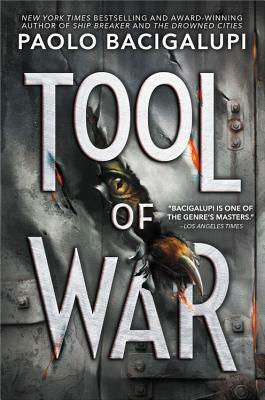 Paolo Bacigalupi is the author of the highly acclaimed The Drowned Cities, Tool of War, and Ship Breaker, a New York Times bestseller, Michael L. Printz Award winner, and National Book Award finalist. He is also the author of the Edgar Awards nominee The Doubt Factory; a novel for younger readers, Zombie Baseball Beatdown; and two bestselling adult novels for adults, The Water Knife and The Windup Girl. His first work of collected short fiction was Pump Six and Other Stories. He co-wrote The Tangled Lands with Tobias S. Buckell. The winner of the Hugo, Nebula, Locus, Compton Crook, John W. Campbell Memorial, and Theodore Sturgeon Memorial Awards, he lives in western Colorado with his wife and son. The author invites you to visit his website at windupstories.com.